Pegasus Universal Aerospace (Pty) Ltd, was founded in 2012 to design, develop, manufacture and sell a disruptive innovation in the aerospace sector: a Vertical Take-Off and Landing (VTOL) business jet that will forever transform air travel for the better. Innovation, excellence and vision. These three words encompass the mission of Pegasus Universal Aerospace. This South African aviation group is fast becoming a trailblazer in its field with regards to promoting transformation and creativity in the aerospace and transportation sector. Led Dr Reza Mia. Having graduated from the University of Witwatersrand with a medical degree, Dr Mia sought to enhance his studies overseas and boasts an MBA from the University of Liverpool, having obtained multiple distinctions. Dr Mia was awarded the Dean’s Scholarship for Entrepreneurship from the London School of Business and Finance for an MSc Finance & Investment degree, where he majored in Investment Banking & Capital Markets, and graduated with Merit. Most notably, Dr Mia completed a dissertation in Aerospace OEM analysis. Dr Mia is the CEO, founder and inventor of the Pegasus VBJ. He found the ideal engineering partners in Mr Matthew Buttle and Mr Dave Taylor of Epsilon engineering. The design was recognized by the Technology and Innovation Institute with a Finalist award, presented to Dr Reza Mia at the Aviation Innovation Awards 2015. Today’s business jets are capable of moving people through the air quickly, but a lot of time is wasted travelling on the ground to and from the airports, which are placed far away from busy financial and residential centers. Eliminating this time-consuming (and frustrating) ground travel would require the use of a helicopter at each end of a trip. This results in the added cost of ownership or rental of an additional aircraft as well as increased planning complexity. Helicopters require large clearances to land and the noise produced by the rotor blades combine to reduce the number of accessible landing spots significantly. Solution: Pegasus Universal Aerospace’s proprietary technology will provide safe VTOL with true business jet performance in flight and direct door-to-door travel. The VBJ will deliver passengers directly to their businesses, rooftops, hospitals, off-shore oil rigs, remote mining and harvesting operations, pipelines, cruise ships, yachts and private residences; the airplane is designed to fit within the 15m standard helipad diameter. There are various business, leisure, anti-poaching, anti-piracy, government and emergency rescue applications that the plane will be capable of providing. Although there are obvious military advantages for an airplane like this over existing military helicopters and airplanes, the company is not planning to pursue any military applications for the airplane; the focus will be on civilian transportation. 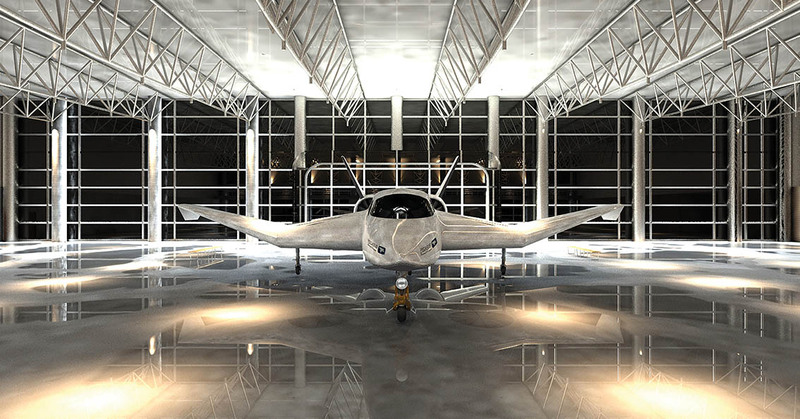 The VBJ is an all composite, VTOL business jet with a cranked di-hedral wing and an x-tail design. The airplane uses three turbo-shaft engines to drive in-wing lift fans and rear thrust fans through integrated gearboxes, all managed by a multiple redundant computer systems. The landing gear layout is still to be finalised between tricycle and tandem with outrigger layouts. The airplane will weigh under 5700kgs to allow for single pilot operation and will fly up to 8 passengers. All information reflected in the performance summary table have been calculated using accepted engineering formulae and CFD analysis. This revelation in the aviation sector, in both design and ability, has the unique capability of VTOL – Vertical Take-Off and Landing. This trait makes it a world first in passenger travel. The VBJ incorporates many other world firsts that are designed to make the airplane not only light, safe & cost effective, but it manages to maximise performance at every level. Automated control systems make the airplane safe and reliable by reducing pilot workload and making the airplane accessible to pilots with less experience, such as a pilot with a PPL and a type conversion. This performance is unmatched by helicopters, piston engine planes and tilt-rotor VTOL airplanes. The interior and exterior design of the Vertical Business Jet is one of futuristic excellence, and is the epitome of luxury. Pegasus Universal Aerospace also holds nothing back as they aim to provide an inviting and exciting experience, each time passengers step aboard. Each jet comes complete with all the comforts and luxury needed to ensure that passengers travel well and arrive rested and pampered. Greater mission flexibility thanks to a far higher number of accessible landing sites. The time saved per mission results in a saving of time up to 45% since the driving time at each end of the flight is reduced or removed. Direct point to point travel with no landing strip necessary. Able to land in built up areas and on yachts & helipads. Added safety in case of damage to the wings, tail or thrust fans. Reduced costs of acquisition where passengers require both a business jet and a helicopter. Lower operating costs, up to 70% cheaper due to reduced fuel burn and component wear. Wings provide lift versus rotors. Far quieter; no rotor noise. Less noise both outside and inside the airplane. Far greater range and speed. Extremities are not flight critical and impact with fixed structures will not result in a forced or crash landing. Therefore greater access to built up areas with safe landings. Easier operation, the pilot is not required to balance the airplane in hover or VTOL mode. Greater safety: in addition to the features listed above, in the event of total engine failure, the airplane is capable of gliding and does not depend on auto-rotation. Lower acquisition, maintenance and running costs. Greater speed, range and comfort. Capable of taking off or landing in either VTOL fixed wing mode . The V-22 and AW609 aircraft cannot land conventionally as a fixed wing when their propellers are in full forward geometry due to their large diameter “props” which would strike the ground. Safer: tilt rotors have flight critical rotor tips, which make landing in a built up area riskier. At almost 25m from tip to tip, the AW609 would not fit within the typical 15m helipad diameter. Of the two fan in wing concepts that have been attempted, the XTI concept is estimated to fly slower than the VBJ with fewer passengers and for a far shorter distance. The VBJ optimizes fans for lift or for fast forward flight, and does not attempt to use a single set of fans for both functions as that results in a fan design that is not ideal for either purpose. Of the Key Success Factors identified for the success of a new airplane design and associated OEM, the company either possesses or has secured the majority of these. Market research conducted over a significant period of time has suggested a clear case of financial sustainability & profitability for the project. Pointing to a large and valuable business jet and helicopter market, the primary and secondary research conducted estimates the value of the combined market at over $560b over fifteen years. Dr. Reza Mia was awarded a Masters in Finance with Merit, in part for his work to find a way to effectively collate various, disjointed market studies to form a more accurate and relevant picture of the market over the next twenty years. The successful profitability of this project bodes well not only for private buyers, but for potential investors as well. Pegasus Universal Aerospace is also proud to be backed by a team of experienced, dedicated specialist and general aeronautical engineers and designers as well as experts in each of the Key Success Factor fields. Sales forecasts: The company uses a complicated financial model to estimate expenses, sales and revenue to produce a comprehensive budget. Using the market studies mentioned above as well as targeted market research, interviews and questionnaires, conservative, realistic & optimistic sales forecasts. These forecasts are used to provide the revenue, profit, NPV values, IRR & break-even information. The optimistic forecasts were provided to the company by an existing business jet OEM during early discussions around partnership and estimate a total of 4 444 aircraft deliveries over fifteen years of sales. If one is to use the selling price for an existing “three engined” helicopter of $24 million, then that sales revenue increases to almost $107 billion. Market research suggests that customers would be willing to pay up to $13m per airplane but it would remain up to market factors to determine the final selling price. The NPV & IRR calculations are performed using the Capital Asset Pricing Model using assumptions which start with the government risk free rate, a market risk premium of 3%, a country risk premium, a start up risk multiplier of 1,5 times and a Beta taken as the average of existing business jet OEMs. NPV calculations are positive across a wide range debt:equity ratios and cost of capital inputs. This is not surprising given the IRR value in excess of 100%. Development funding: the company is currently funded by the founding shareholders but total project funding is planned to combine a mix of government grants & incentives, private investors, a specialised long-term bond and customer deposits. The total development funding required to take the project through to certification and early industrialisation is surprisingly low thanks in part to improvements and advances in the design and manufacturing processes. This value is confidential at this stage. The company is currently in discussion with potential investors and would welcome any interest from new investors but would advise that all investors would need to be cleared from both financial and ethical aspects. The primary target customers for this airplane are individuals, government agencies and companies that find it necessary to own both business jets & helicopters. The opportunity to provide a solution to their requirements using a single airplane will result in lower capital outlays, reduced maintenance costs, simplified operations, lower staff costs and greater mission flexibility. An additional advantage is that there is a direct point-to-point flight that excludes the current flight to the airport where additional time is wasted transitioning between the two aircraft types. The ability to land on private yachts adds an additional dimension to an already impressive airplane. The secondary target market is made up of owner-pilots, police, anti-poaching agencies, anti-piracy agencies, search & rescue operations, air-ambulances, cruise ship operators, off-shore oil rig operators, remote mines & farms, existing business jet or helicopter owners, charter operations and air taxi companies. Geographically, the bulk of the market exists in the North America, Europe, the Middle East and the fast developing countries in Asia. The company owns all engineering IP as well as trademarks to the names and images used. The concept was initially protected by a provisional patent which allowed the concept to be protected without a public disclosure, and is currently protected by a Patent Pending on the International PCT system which provides protection in every country of relevance. Following an invitation to Georgia to assess potential business investments, Dr Mia was fascinated by the light jet which had been developed by TAM, the Tbilisi Aerospace Manufacturing company, for which it was seeking investment to industrialise the design. Unfortunately the design was not unique and bringing the blueprints back to South Africa would have been a costly mistake. A number of potential ideas that would have made an airplane unique were considered but it was VTOL that stuck out from the rest to give birth to the VBJ. From there, a team of South African engineers conducted a Conceptual Design Study and the company conducted market research, financial feasibility studies, profitability estimates, interviews, research and asked another engineering firm to complete an assessment if the work already done. Using traditional engineering calculations as well as modern Computational Fluid Dynamics to add significant data to the engineering knowledge base and to provide the company with an Independent Design Review which again confirmed the initial results and strengthened the case for the VBJ. The company is now entering the detailed design phase of the project with a de-risking exercise aimed at exploring solutions for the requirements of the six major sub-systems of the airplane as well as to hammer out as much of the residual market risk as possible. A scale model is currently under construction which will serve the dual purpose of providing developmental data to the team as well as for marketing purposes. Total project risk reduction is at the top of the list of priorities for the company and one of the innovative solutions under consideration is total project insurance, which if secured, will protect all investor funds should the project fail to reach certification and profitability. Avionics: Adjustments will be required at the Control Systems and Automation level with minor adjustments to the avionics using a blend of avionics suites combining both helicopter and business jet elements. An avionics supplier has not yet been confirmed. And exploratory discussions are in process. Engines: Standard turboshaft engines. All novel aspects occur outside of the engine but some re-certification might be necessary to allow for operation at higher altitudes. The engine supplier selected cannot be disclosed at this stage due to confidentiality requirements but will be announced soon. The AW609 is the first VTOL airplane to seriously seek FAA certification. Much progress has been made, despite a recent crash in Italy, with FAA certification expected in 2017. Other similarities with which the 609 has paved the way for the VBJ are: fly-by-wire, drivetrains, HUD systems, transition between Vertical & Horizontal flight and the FAA certification basis which is an amalgamation of Part 25, Part 29 & Part 21.17 as a “special class aircraft”. The new aspects that the FAA will need to address for the first time (as far as we know) are the novel aspects of the airplane such as the gearboxes, use of lift fans and potential requirement for descent arrestor systems. It is unlikely that the VBJ will require additional arrestor systems as the plane should be at least as safe as a helicopter or quite probably, much safer, given the three engine layout, low stall speed and advantageous glide characteristics. The 609 FAA certification program included special provisions in addition to parts 25, 21 & 29 specifically created for the tilt rotors under a newly established category known as powered lift. Therefore, there will be many similarities already seen by the FAA but also many new provisions, however, it can be seen that the FAA is willing and able to establish new rules for new airplane types. It has been estimated that the AW609 will require two thousand hours of flight-testing to reach certification, of which at least 1200 hours have been flown already. Pegasus has budgeted for three thousand flight hours for certification to account for potential additional tests given that the AW609 is based on the V22 Osprey, which has accumulated considerable flying time. However, it is not necessary that the VBJ will require more flight hours than the AW609 as the 609 is very different from a control systems point of view to the osprey with automated tilt rotor positions and the ability to auto-rotate. Therefore, as a new type of airplane for which the FAA made new provisions and accommodations for, its certification and flight test estimates should not be as much as 33% less than what Pegasus has budgeted for the VBJ. As a matter of fact, the experience that the FAA now has due to the AW609 program might allow for a more streamlined approach to the VBJ certification leading to a reduced number of flight hours required. Therefore the estimate of three thousand flight hours is sufficient, including an allocation for noise certification. The future of business aviation is VTOL and the future is fast approaching. For more information visit www.PegasusUA.com or use the contact details in the advertisement.